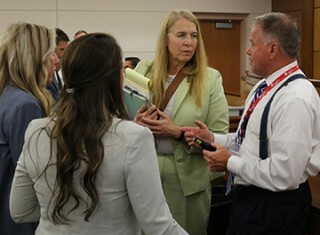 Judges, prosecutors, public defenders, probation officers, and other professionals associated with the criminal justice system recently met in the Dandridge, Tennessee courtroom of Judge Duane Slone to learn about an innovative program he started to help certain offenders with substance abuse problems avoid incarceration, find treatment, and lead happier, healthier lives. The TN ROCS docket—ROCS stands for Recovery Oriented Compliance Strategy—serves drug offenders who have an urgent need for treatment but who are not considered at a high enough risk of recidivism to qualify for time and resource-intensive Drug Recovery Court programs. “An adequate assessment and referral to appropriate treatment, frequent accountability, and a big stick” are the three components of the program, Judge Slone said. Before being placed on the docket, TN ROCS participants are partnered with criminal justice liaisons who perform clinical assessments and draw up evidence-based behavioral health treatment plans for them. These plans often consist of things like intensive outpatient therapy and medication-assisted treatment. TN ROCS docket members then meet regularly with corrections officers who check that they are adhering to the standards of their behavioral health treatment plans. Docket members also make regular appearances before Judge Slone in his 4th Judicial District courtroom to give updates on their progress. The more progress is made and the longer participants adhere to the requirements of their treatment plans, the less frequent these appearances become until Judge Slone declares them finished with the program. This typically takes around two years. The “big stick” aspect of the program comes from the powers inherent in Judge Slone’s position. “As a judge I’ve got what every caring parent or person with an addicted love one wishes they had, control over the loved one’s liberty,” Judge Slone said. That means that there can be real consequences for infractions, such as lying. The TN ROCS docket has been such a success in its five years of existence that it has become a key component of Governor Bill Haslam’s TN Together initiative to fight opioid-driven addiction and will soon be expanding to four additional judicial districts thanks to funding from the Tennessee Department of Mental Health & Substance Abuse Services (TDMHSAS). In advance of the expansion of the program, Judge Slone and TDMHSAS held an implementation training session in Dandridge to explain TN ROCS docket in greater detail to other judges interested in setting one up. “At the end of the day what we’re trying to do is get you healthy,” Judge Slone told one new enrollee to the TN ROCS docket at the training session. The man had been arrested for violating his probation, but, thanks to the TN ROCS docket, he would be entering a treatment program in Knoxville rather than heading to jail. There, he would be subject to weekly drug screenings and would be expected to conform to his behavioral health treatment plan. The man’s path to the TN ROCS docket was typical. He, like the majority of the docket’s 200 participants, was referred to the program after violating his probation. Others join the program as a condition of their original sentencing. Referrals to TN ROCS can come from any number of sources, including district attorneys, jails, judges, family members, or even the offenders themselves. These are typically non-violent offenders with demonstrated, persistent substance abuse problems who just cannot seem to break the cycle of their own addiction. A number of these people were in court on the day of the training session, as Judge Slone oversaw a regular TN ROCS docket in the morning for the benefit of those in attendance. Judge Slone makes a special point to establish a warm rapport with docket members. He greets each of them warmly and frequently asks how they and their family are doing. “How are you? How is the baby?” were typical questions to a young mother with a young child. This type of interaction represents Judge Slone’s genuine care and interest in the participants, but it also serves a purpose: to demonstrate that a courtroom does not have to be a scary place. It is a message that has gotten through to docket participants. That attitude results in a courtroom where docket participants feel free to share their stories of struggle and empowerment. One woman told Judge Slone how she started using drugs when she was 8 years old. Thanks to the TN ROCS docket she has now been clean for eight-and-a-half months. “This is the longest ever in 30 years that I’ve been clean,” she said. “I’m super proud of you,” Judge Slone said. Another young mother recounted how she was arrested eight times between the ages of 18 and 20 due to her addiction. She had already lost custody of one child when she ended up in jail pregnant with another child, an adorable brown-haired baby that she held in her arms in Judge Slone’s courtroom. She entered the TN ROCS program and was able to gain back some of the control she lost. “I look back now, and I don’t even recognize that person,” she said. “I’m super grateful for what you’re doing,” Judge Slone said. Of course, the program relies on more than just a caring attitude and positive reinforcement. TN ROCS is not easy street. It requires buy-in and hard work from its participants. Not all of those participants understand that at first, as Judge Slone readily admits, but most of them come to that realization. And if they do not and are not willing to modify their behavior, then there still are real consequences. That stick can mean a return to jail if a person fails to abide by the terms of their behavioral health treatment plan. Oftentimes, though, Judge Slone will use other measures to get someone back on track. At the training session, one participant had missed the intake for his treatment program. Judge Slone ordered him to home confinement until the next intake date. In other cases, he has ordered people who relapse to write letters outlining what they would do with their lives if they could get off drugs. Whether he is using a carrot or a stick with TN ROCS docket members, though, Judge Slone is always aware of the responsibility that his position carries with it. As he emphasized to his fellow judges, he considers it of the utmost importance that judges who deal with addicts in their courtroom educate themselves about addiction, recovery, and treatment. Judge Slone’s compassion around this issue comes partially from personal experience. In 2011, he and his wife, Gretchen, adopted a young boy, Joseph, who had been born with neonatal abstinence syndrome. Joseph’s mother was an addict, and he was being cared for by his grandparents before the Slones volunteered to bring him into their lives. Judge Slone was already operating a Drug Recovery Court by that time and was familiar with many aspects of addiction, but, seeing his new son’s struggles, he became determined to learn as much as he could about the issue. “I had to know what was so powerful that a woman with a baby inside of her could continue to use drugs throughout a pregnancy,” he said. What he learned would help him to understand as never before the pull of drug addiction, which can inspire cravings 10 times more powerful than hunger pangs and result in greatly diminished judgment and insight. That education led to the creation of TN ROCS, which has seen young mothers of healthy babies become one of the docket’s biggest success stories. According to a review of information carried out near the docket’s third anniversary, TN ROCS participants had 34 babies over that three-year period. Not only were all of the babies born healthy, but 30 of the 34 mothers of those babies were able to retain custody of them. That is far above the average for women with behavioral health issues who are involved in the criminal justice system, Judge Slone said. The same review uncovered other impressive numbers as well. Just 30 of 94, or 32 percent, of people placed on the TN ROCS docket during the three-year period went on to be charged with another crime. The state average for recidivism in the criminal justice system is 49.5 percent. That number is even higher when you look specifically at offenders with behavioral health problems, Judge Slone said. Of those who did re-offend, Judge Slone said most of them were charged with low-level property crimes and are back on the TN ROCS docket now. Judge Slone points to other signs as well that the docket he started five years ago is making a difference. For instance, not only is TN ROCS helping to push back the tide of the opioid-driven addiction crisis, it also helps to free up space in local jails. Neither Jefferson nor Grainger counties—the two places where the TN ROCS docket is currently active—have overcrowding in their jails, Judge Slone said. “You look at every other county similarly situated across the state and over the last 10 years and there’s been an exponential increase in overcrowding,” Judge Slone said. He also mentions the fact that burglaries have decreased by 50 percent in Grainger County in the last three years. Judge Slone cannot say with certainty that TN ROCS is the sole reason for that decline, but crimes like burglary are often fueled by addiction and if people receive treatment and overcome their addictions then they have less incentive to steal. Those markers of success represent part of the reason that the model has been embraced on a statewide level by Governor Haslam as a way to deal with the state’s ongoing addiction crisis. Another reason, though, has to do with resources. Drug Recovery Courts have seen positive results in Tennessee, but these programs are resource-intensive, often requiring a large number of volunteers to operate. Participants must complete a highly structured, four-phased recovery process to complete drug court. Judge Slone has been running a Drug Recovery Court since 2009, but as he looked at the breadth of the crisis in the area he serves, he knew that something else was needed. He decided to take inspiration from the Drug Recovery Court model and forge ahead with a new strategy. Basically, in criminal court, the only additional resource needed to operate a TN ROCS docket is a criminal justice liaison. That is because, as Judge Slone is quick to point out, TN ROCS is not a court, it is a strategy. He actually uses the TN ROCS model for some child custody cases that involve a parent struggling with addiction, as well. The combination of high efficacy with low costs means that the TN ROCS example is one that could easily be replicated throughout the state and nation. Tenth Judicial District Criminal Court Judge Sandra Donaghy, based out of Cleveland, Tennessee, is one judge who is involved in the effort to do just that. Judge Donaghy attended the training session and came away convinced that Judge Slone’s approach could be beneficial to her district. She said she plans on establishing a TN ROCS docket in the 10th Judicial District as soon as a criminal justice liaison is approved and appointed. Second Judicial District Criminal Court Judge James Goodwin was similarly impressed by the training session. He had heard Judge Slone speak about the TN ROCS docket at a statewide conference for judges in March and had subsequently expressed interest in starting a similar docket in Sullivan County. Judge Goodwin sees the docket as a winning way to reduce jail populations and confront the opioid-driven addiction crisis. Judge Duane Slone discusses the TN ROCS docket with attendees at a recent training session in Dandridge. Judge Sandra Donaghy is to Judge Slone's right.